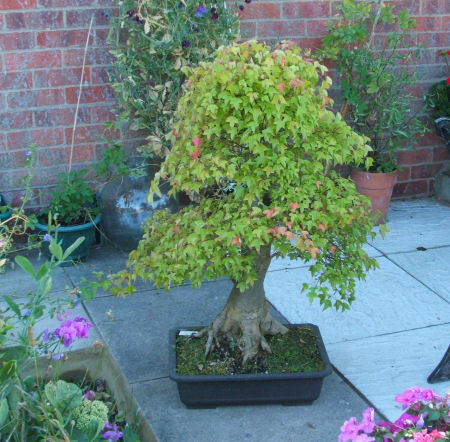 This bonsai was originally purchased in the summer of 2007 as a 'finished' tree. So unlike many of the Bonsai Progressions I have published here, there were relatively few jobs required to make this tree presentable. However, improvements both horticulturally and aesthetically, could still be made. August 2007. Immediately after purchase from a bonsai nursery in Norfolk, UK. The Trident was the last of a number that had been imported around 8 years beforehand and this particular one had remained unsold since. At 75cm in height, it had an impressive size and judging by the colour of the foliage was in fairly good health. It had a wide if ugly nebari/trunkbase and the trunk had a section of inverse taper when seen from the tree's current front that did need addressing. Of most immediate concern to me was the state of the soil that the bonsai was growing in. As can be seen in the image above, the soil surface was covered in a weed known as Liverwort. 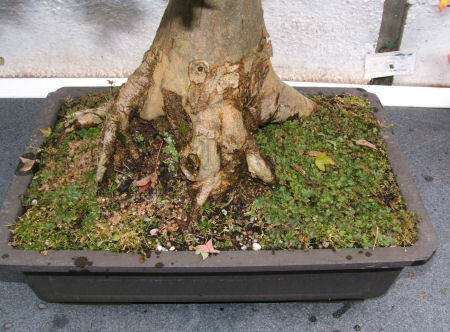 Liverwort is a hard to remove weed that prefers wet organic soils; its prescience is a strong indicator of a soil that is too wet and poorly drained. After gently lifting the rootball out of the pot, the roots could be examined. 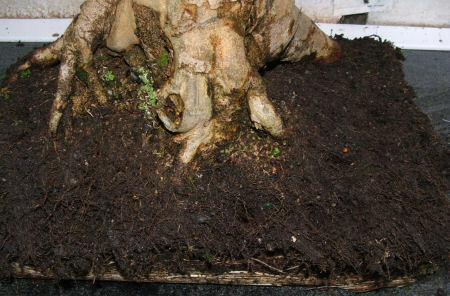 The tree had healthy roots however they were all growing around the base of the pot and within the soil itself; another indicator that the soil was airless and too water retentive. The thin white roots in the upper layers of the soil are those of the liverwort. Without bare-rooting the Trident, it would be impossible to remove all traces of Liverwort as any roots left in the pot will regrow. So at the earliest opportunity I would need to bareroot the tree and remove all of the old organic soil (and along with it, the Liverwort) and replace with a good quality inorganic soil. 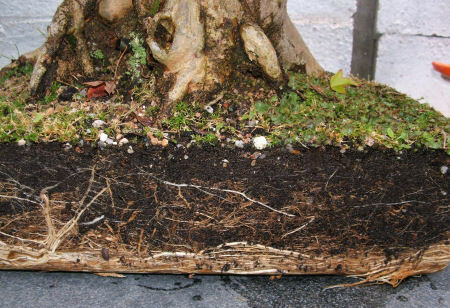 With a well aerated inorganic soil, the roots would grow throughout the soil and not just head down to the bottom of the pot as they can be seen to have done in these images! As it was August when I acquired the bonsai it was not possible to carry out a bare-rooting and 100% soil change, this would have to wait until the following Spring. However, I was safely able to remove a large amount of the surface soil without disturbing any of the roots and replace it with inorganic soil. Not only did this remove all of the liverwort but I was able to remove a large amount of liverwort roots. By introducing good quality soil, I also gave tree somewhere healthy for it to grow new roots. When I repotted the tree again during the following Spring, new roots had completely colonized the inorganic soil already! 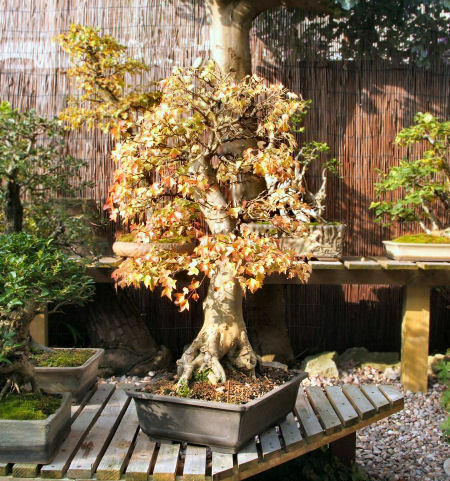 October 2007: the Trident bonsai shows its Autumn colour's as the leaves fall and is an impressive sight. Now that the leaves had started to fall I was able to study the trunk and branch structure clearly for the first time. 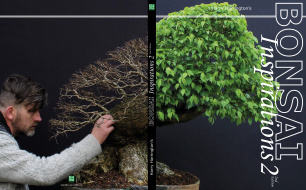 The image above shows the new front I decided on for the bonsai; from this direction the trunk is more interesting and has better movement. It also means that a small area of negative taper in trunk cannot be seen from the front. The trunkbase is not as wide from this new front however it looks more natural and suits the dynamics of the trunk shape well.